Which one is number one? After many continuous conferences the Bigeast secretariat, taking everyone’s demands and requests into consideration, we have decided to continue the existence of Bigeast. 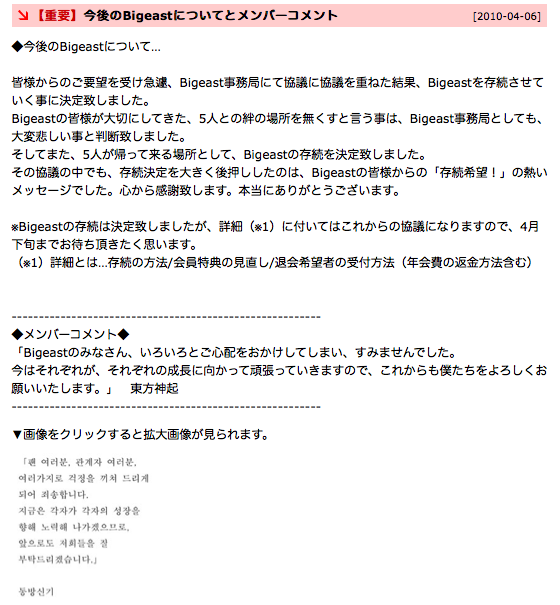 We have come to decide that to discontinue the existence of Bigeast, a place that everyone treasures and a place of bonds with the 5 members, would be an extremely painful thing to Bigeast secretariat to do. For that reason, we have decided to continue Bigeast, a place for the 5 of them to return to. Moreover, during the conferences, the big reason that has help us to come up with this decision was the passionate “Please continue!” messages from everyone in Bigeast. Although we have decided to keep Bigeast continued, we would like you to wait please wait for a little while until the end of April for more further details*. Bigeast no minasan, iroiroto goshinpaiwo okakeshiteshimai, sumimasendeshita. To everyone in Bigeasts, we are sorry that we have made all of you worried. 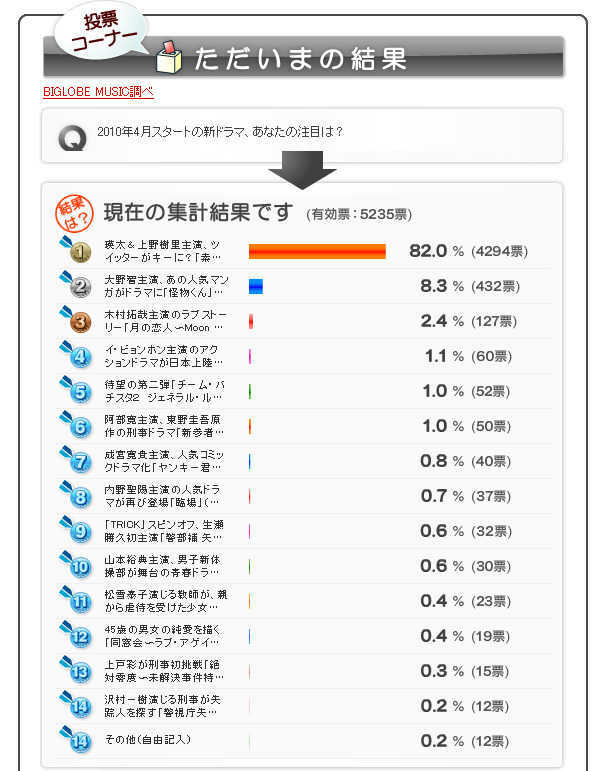 Imawa sorezorega sorezoreno seichouni mukatte ganbatte ikimasunode. korekaramo bokutachiwo yoroshiku onegai itashimasu Tohoshinki. 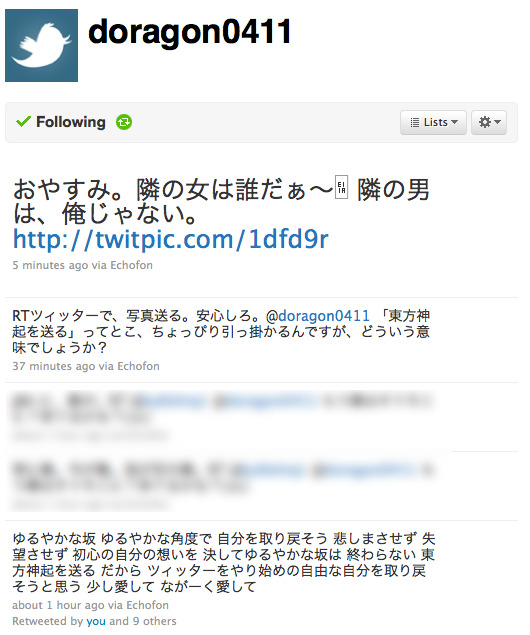 Each of the members will do their best to advance forward respectively, so please support us in the future, too. 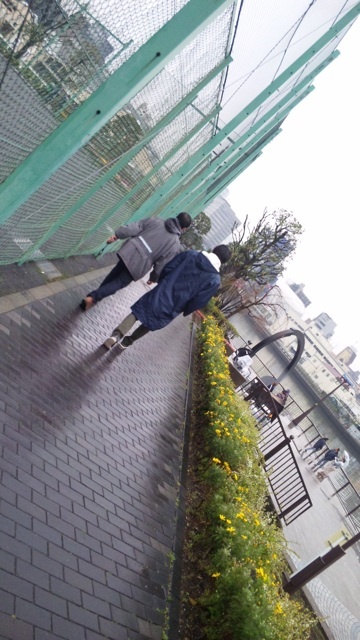 Tohoshinki. T/N: Members’ comments are in both Korean & Japanese. The Korean Pavilion was created in order to coordinate with the Shanghai Expo’s theme of “Better City, Better Life”. It will showcase the combination of culture and art as one, making it the revolutionary city that it is. The outside of the pavilion will be constructed into “Korea Root” (in Hangul), and the inside will be consisting of 3 floors. During that time, there will be a performance stage, a movie theater, Korean traditional music, B-Boys, Qing Opera and other high quality performances. An estimate of 6 million people is expected to attend the event, and the financial investment is equally large, with the construction finished near late-March. In order to leave everyone with a broader and richer impression of Korea, immensely popular TVXQ member, Jung Yunho, is currently in the process of shooting a promotional video. Korean celebrities that will attend the event include; Rain, Jang Na Ra, 2PM, Jo Su Mi, and other global stars. and they talked about the difference of Japan and Korea’s show business. 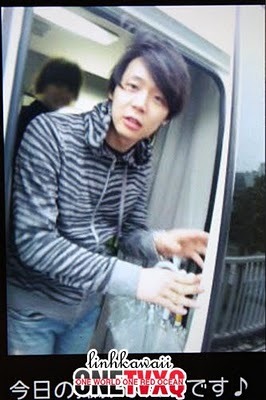 An extreme picture of YuChun who changed out of his outfit coming out from the makeup car! Moreover, in order to leave a little impression in the hearts of the people who are living in this period of time, from our heart, this little company avex* is very thankful to our friends, to our artists, and to the people who have been supporting us. I believe that to create a work that will remain in the hearts of others is much more important than to become rich or famous. Therefore, from now on, I want to keep living and embracing that thought in my heart. I don’t have time to argue with worthless defamation from anyone. This little company called avex* would be very thankful if we can leave an impression, even if it’s just for a little bit, in the hearts of the people who are living in this period of time. *The literal translation of that would be “this damn avex,” but it doesn’t apply to the context of what’s he’s talking about here. He is trying to be humble by honoring other people, so I believe “this little company avex” would be a more appropriate translation. Good night. Guess whooo the girl is~ The guy is not me. Q: I noticed that you said “sending Tohoshinki away”. What do you mean by that? A: I mean that I will be sending away their pictures on Twitter. Don’t worry. 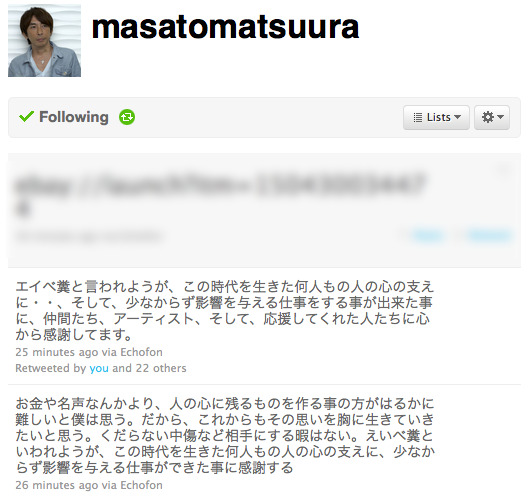 **What he was saying here is very poetic, but it’s really hard to understand. A lot of people have tweeted him to ask him about the meaning of it too.